When I first started riding, long motorcycle trips weren’t really on my mind. I was focused on the vintage cafe racer scene, and motorcycle touring simply wasn’t part of that vision. But then, I moved to Oregon, which changed my riding in ways I never expected. The challenging roads encouraged me to improve my riding skills, the vintage motorcycle community inspired me to begin my own build, and the natural beauty left me no choice but to learn to ride harder and farther. This is my first summer with a modern, fuel-injected bike, so I’ve been riding more than ever before. In May, I rode 250 miles on International Female Ride Day and 300 miles around Mt Hood with Karl’s Mystery Ride. But my crowning achievement last month was my 650-mile solo round trip to Vancouver, Canada. When my now-fiancé J told me he had a work conference in Vancouver at the end of May, I knew immediately I would ride up there. It was the perfect opportunity for me to spread my motorcycle wings — especially because I’d have a hotel room waiting for me. However, I knew I needed some luggage. I’ve had enough experience with backpacks to know I didn’t want to wear one for a six-hour ride to Canada. 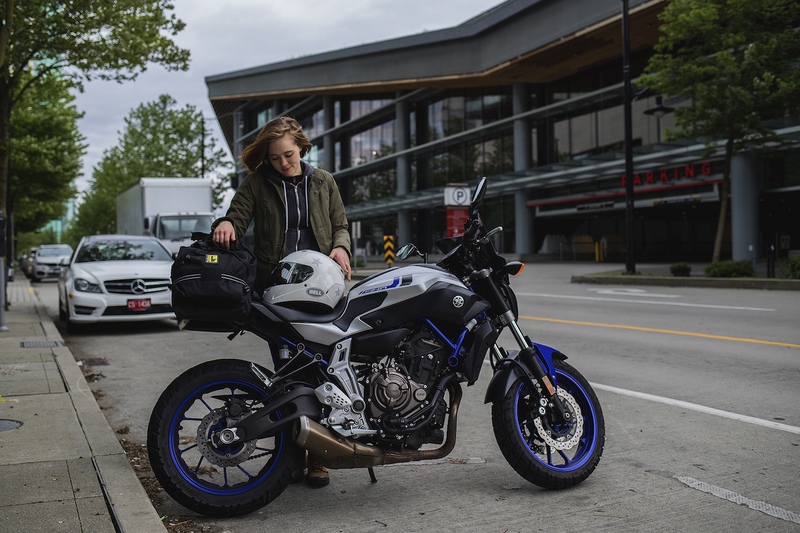 Unfortunately, the FZ isn’t built for luggage. The rear end is covered in fairings; any mods would take time I didn’t have and money I’d rather not spend. 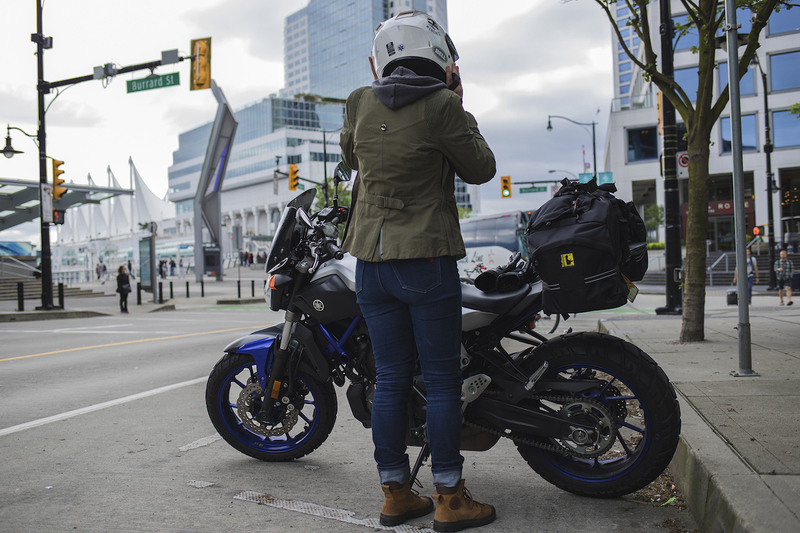 Enter the Wolfman Beta Plus Rear bag — a duffle-saddlebag hybrid that mounts to your passenger pegs. 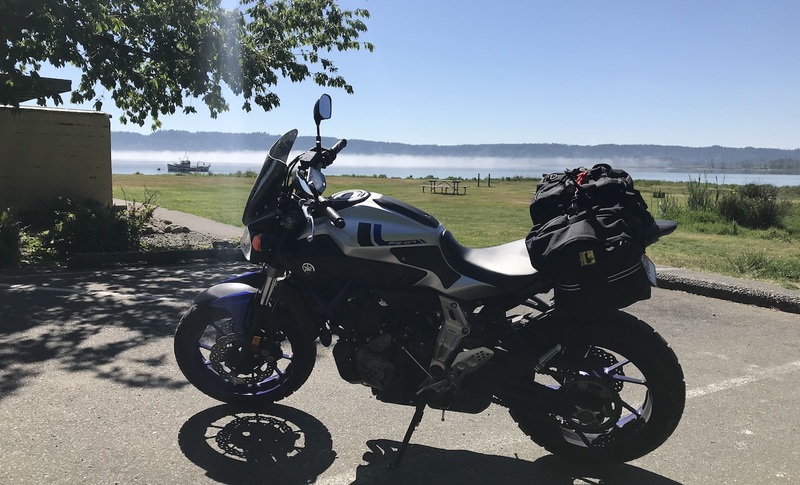 It’s not the most attractive piece of luggage (the Revzilla product description calls it a “daddle bag”), but the price was right. So I went for it. When the bag arrived, I rushed outside to see how it fit on the bike. In fifteen minutes, it was secured onto my rear seat. The front mounting straps fit snugly around my passenger peg mounts, and the rear strap cinched up underneath my license plate mount. Even completely empty, the bag felt stable. I was impressed. I decided to try the bag out on a group ride before my Vancouver trip, just to work out the kinks. I didn’t fully pack it — instead, I filled the saddle bag portions with my camera gear and supplies, and tightened the bag’s compression straps over the top as far as they would go. The test run turned out to be a good idea, because I learned an important lesson about straps. I didn’t knot the left front mounting strap tight enough, and during the first half of the ride it wiggled loose. The bag began to slip further and further to the right, while the rider behind me panicked. Fortunately, we reached our first stop before the bag fell into the wheel, so I was able to re-tie everything, pulling it as tight as I could, and then some. To keep everything lifted and stable, I added a zip-tie across the top, which helped quite a bit. For the rest of the ride, the bag worked perfectly, though it was strapped to hell and difficult to get anything in and out. I don’t recommend using the Wolfman Beta Plus exclusively as a saddle bag, but in a pinch, it worked just fine. The days before the Vancouver trip, I packed and re-packed my Beta. The Beta is a respectable 45 liters, and I had plenty of room to spare — enough to bring two pairs of shoes, books, my portable jumpstarter (just in case! ), and my laptop. Packing cubes kept everything organized, and I replaced my zip-tie top strap with a bungee for easier access. Finally, at 7 AM on a Tuesday, I set off for my first solo long-distance ride. It was a perfect day, sunny and 60 degrees, and the highway was quieter than I expected. I blasted up I-5 to Olympia, making it to a fuel station south of the 101 exit just after 9 AM. When I turned off I-5 onto the quieter 101, I was in heaven. On any normal day, I would have still been waking up, pouring my first cup of coffee, but instead I was already 100 miles from home, flying through the lush Pacific Northwest countryside. There aren’t many scenic ways to get from Portland to Vancouver — at least, not ones that don’t double the duration of your trip. But the 101 was definitely worth the extra two hours. 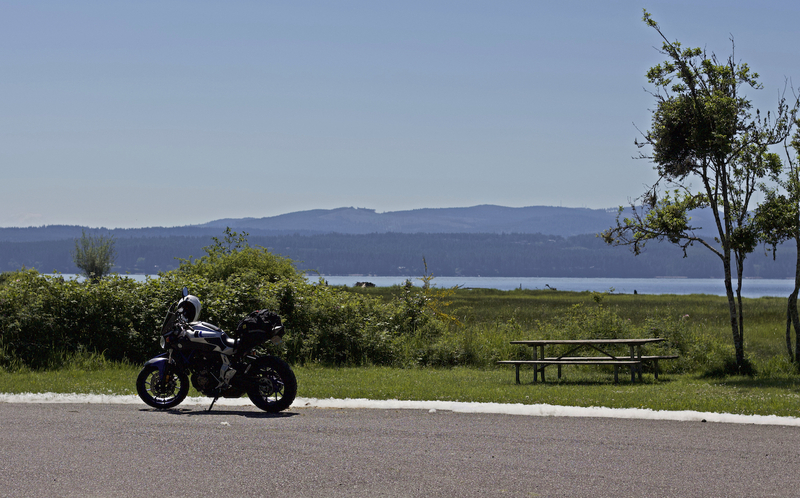 About 30 miles off the freeway, the road narrows and the trees open up to display a scenic view of the Hood Canal. When I reached Potlatch State Park, the fog was still rolling off the water, and I impulsively pulled off the road to enjoy the view. Later, when I got hungry, I pulled into a small picnic area at Dosewallips State Park for lunch. It was barely 11:30 AM, and I was more than halfway to Vancouver. I took my time, making sure to stay hydrated and fill myself with jerky and fruit. I skated into Port Townshend just four minutes before the ferry departed. As a motorcycle, I got a premium place in the front. The two other riders did not seem as impressed as I was by the view. 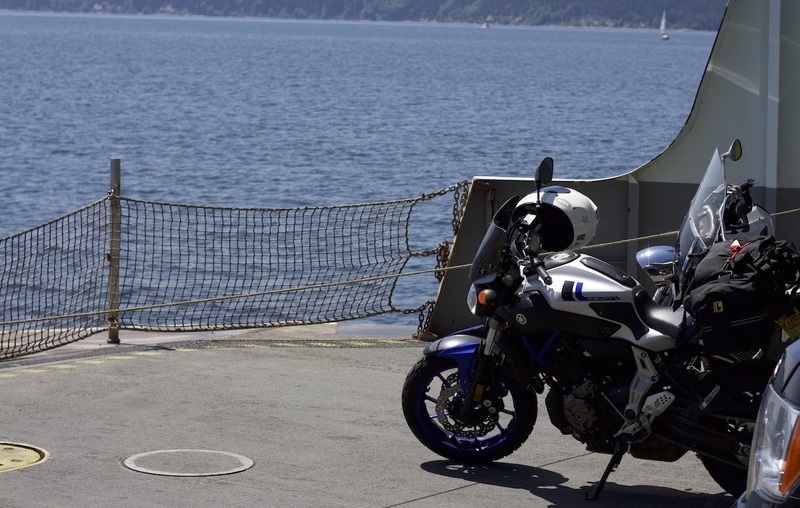 I stayed out on the deck the whole ride, thrilled to be on the water with my motorcycle on such a glorious day. From there, the trip was a straight shot. I next filled up in the eerily manicured town of Coupeville, then got my final tank of gas (just in case) just south of the Canadian border. 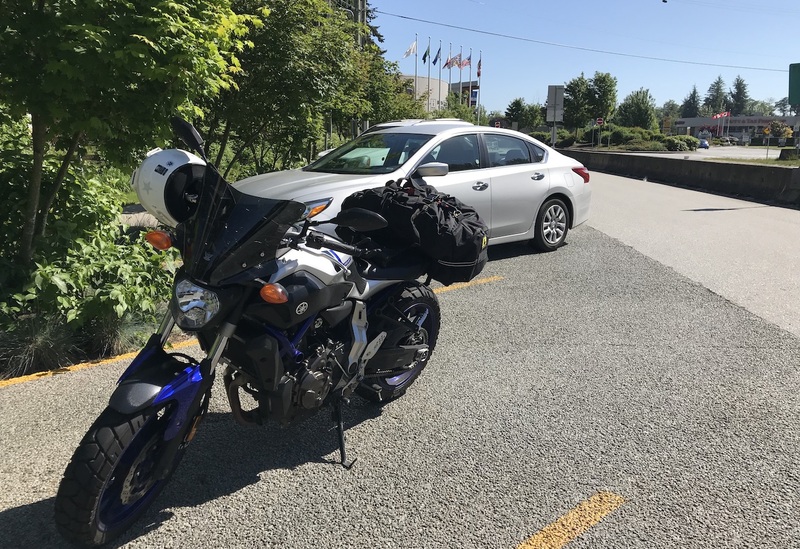 I had never crossed an international border in a car before, much less on a motorcycle, and the whole process was easier than I thought it would be. I kept my passport was handy, and before I knew it I was riding off into Canada. When I finally made it to the hotel, I had been on the road for ten hours. Frizzy-haired, with bloodshot eyes from allergies and the wind, I sat on the sidewalk next to my Beta bag, waiting for J. I must have looked a mess, because a kindly man asked if I was okay. I waved him on, smiling, but he didn’t seem convinced. That night, after a well-deserved hot shower, I slept soundly. Like many riders, I began my riding journey with a narrow perspective on riding. For me, it was cities and cafes, vintage bikes all the way. I had no idea how much I would enjoy the solitude of the road, and the freedom of carrying everything I needed on two wheels. Alone on the road, you don’t have to answer to anyone. There’s no one to coordinate stops with, no one to apologize to when you make a wrong turn. I worried that it would get boring, and I even considered listening to music on my earbuds, which I never do while riding. But as it turned out, the companionship of the road, the wind, and the sky was all the entertainment I needed. I marveled at the intimacy of the small towns I passed through, danced my bike over winding roads, and breathed in the majestic freshwater views. All kinds of riding are an escape, a departure from the day-to-day. But long, solo rides are their own kind of zone. There’s no need to hurry when there’s hours of riding ahead — rushing will only tire you out. You have to accept that the miles will only ever pass one at a time. All you can do is relax and take each one as it comes. I’m already craving my next solo ride. Hopefully next time it will be even more beautiful, and with even less traffic. Central Oregon, here I come. Disclaimer: Links to Revzilla in this article are affiliate links, which means if you click on one of these links and then make a purchase, I may receive a small commission at no extra cost to you. Thank you! I didn’t think my chest could fill with more air for you after I read “Emergence: The Motorcycle, The Mechanic,” but I was happy to be proven wrong. Thank you, as always, for continuing to bring us on this deeply personal journey of yours and all the highlights (without shielding us from the difficulties) along the way. Best to You & J; and Enjoy the Macarons (Nicole’s favorite)!